Extends IVRs by transforming them into collaborative web-based voice and visual mobile applications. 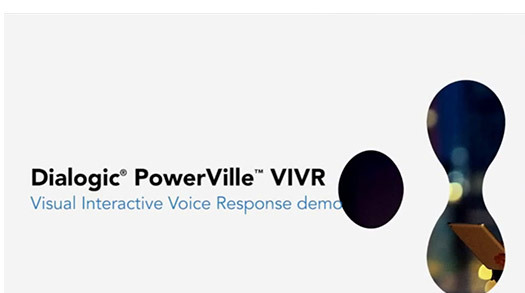 Dialogic® PowerVille™ VIVR – Visual IVR extends the capabilities of IVR by transforming it into a collaborative web-based voice and visuals mobile application for smartphones. By being able to share visual content during a standard voice call, PowerVille Visual IVR offers a mobile experience that conveniently and effortlessly engages the caller, improving first call self-service resolution rates. Add to the visual content the ability to collect alpha-numeric data through information-rich input to exponentially minimize the need for callers to transfer to agents, further reducing inbound calls and zero-outs as the enhanced user experience leads to lower interaction abandonment and better average handle times. PowerVille Visual IVR can facilitate an omni-channel experience by giving a caller the option to transfer the call to an agent, start a chat or text session, send an e-mail, or request a callback. Thus, even in situations where the caller’s specific concern(s) might have yet to be addressed, giving them the ability to choose how to continue can help them maintain a positive view as to the overall experience. Furthermore, if the call has to go to an agent, PowerVille Visual IVR can intelligently route the call to the appropriate agent with context and continuity, reducing both call disruption and the need for information repetition by the caller. Additionally, if the visual portion of the call is still active when the call is transferred, the agent will be able to push content to the caller and also be able to see what the caller is seeing.